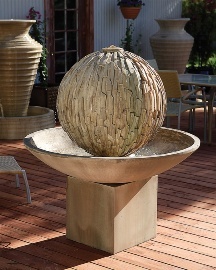 Water fountains by Aqua Fountains, fine art decorative outdoor and indoor water fountains, captures the majesty of flowing water and richly hued natural stone in a strikingly styled selection of home office and garden-themed water features. Aqua Fountains’ wall, floor, garden and table top water fountains are completely hand-crafted using the finest natural materials – highest quality, subtly shaded Rajah slate, hand-set river rocks, Italian marble, sparkling glass, and shimmering copper. projects, from complex to simple – at hotels, restaurants, medical and professional offices, spas, public spaces, and residences. We pride ourselves on delivering a unique water fountains and features. Please visit our new section Public Spaces & Corporate Fountains. Aqua Fountains' floor water fountains creates a relaxing ambience.